Welcome to The Session – a collaboration of bloggers writing on a common beer-related topic. For the month of December, Mike R. Lynch of Burgers and Brews chose "An Unexpected Discovery: Finding Great Beer in the Last Place You’d Look" as the collective topic to explore. A round-up of all the blog posts will be posted in the near future. You can read more about Beer Blogging Friday (“The Session”) over at the Brookston Beer Bulletin. One of the things I love best about The Session topics is their breadth. 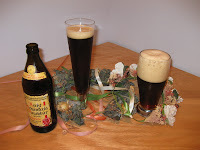 Mike's comments on the topic end with "Write about a beer experience that took you by surprise." This statement got me thinking about one of Lug Wrench's favorite topics, homebrewing, and a strange place that I found some homebrewing ingredients. A beautiful summer day in June of 2009 found my family taking a scenic drive through the Virginia countryside. On our list of things to do were to enjoy a picnic lunch, stop at a couple of wineries, and tour two distilleries. There are two operating distilleries in Central Virginia near my house and I had not visited either of them. The second distillery was the real gem, and the most fun stop for me on our entire trip. I first saw mention of The Copper Fox Distillery on the Mad Fermentationist's blog. Copper Fox is located in Sperryville, VA in an old apple processing facility. The owner, Rick Wasmund, and his "Master of Malt" (Mom) operate the distillery and provide very personal and educational tours. They have an innovative aging process where they age the whiskey in contact with apple and cherry wood, which imparts an interesting color and taste to the whiskey. But, the coolest thing of all is that they malt their own barley. Copper Fox uses 6-row barley as the sole ingredient in their whiskey. They get the barley from one farmer, who lives about 3 hours from the brewery, and bring the raw grain directly into the distillery. Then, during the cool times of the year, they soak the barley in giant vats and then lay it out on the floor of a special section of the building. They let it germinate and then they kiln it right there on site, using apple and cherry wood. This imparts the malt with a interesting smokey note that helps make the whiskey distinctive. At the time, Rick thought they are the only distillery in North America that malted their own grain. Rick was kind enough to send me home with a sample of this special malt. The malt was a very special gift and it created a wonderful back story for the German-style rauchbier I made from it. The story behind that beer made it far more memorable for me than other beers I have made since, so much so that I clearly recall it more than a year and a half later. Something as simple as the gift of a raw ingredient by a generous distiller resulted in my unexpected beer discovery. In short, the last place I ever expected to find good beer was from small Virginia distillery.